Prof. Ho-Kyung Kim ,Kil-Je Jung, Yun-Hwa Hong and six laboratory member attended the 15th WEIK symposium in Pohang, Korea on 31 May 2012. 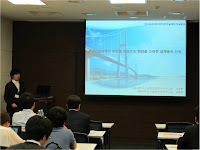 The professor made a presentation the title of which is "Super long-span bridges : Realization of 2,800m suspension bridge sustainable to 200 years". 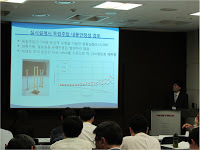 Ho presented the title of which is "Buffeting Response of ULSAN Bridge Pylons under Erection Stages". 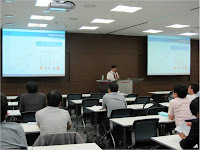 Chul-Hwan made a presentation the title of which is "Evaluation of design wind speed considering the local topography of the site".